Before you update the schedule for the first time, create a baseline to make a complete copy of original schedule and plan data. Project schedule, resource hours and cost can be used a baseline methodology of presentation that identifies original schedule and compares against the current project status. - With the help of project manager, identify the project milestones in schedule from the major milestones that contained in master schedule (executive level) and leve3 control schedule. - Once all stakeholders and the project team agreed the plan (schedule, resource hours and cost estimate), make sure schedule is quality checked. - And then, the original project plan shall be used to create a project baseline or targeted plan. - As the project progress, review the project schedule on periodically basis. - Prepare project status report such as milestone report, critical and nearly critical reports, schedule variance, cost variance to analyse how well your project is going. - Bring up the issue with the project team if the project performance is poor, find the reasons and resolve the slippage by expediting work if practical. - Make sure your team is actively participating in periodic schedule reviews. - If the project team decides not to resolve the slippages, the team should make a judgement call whether to initiate or not to initiate Change Management Process. 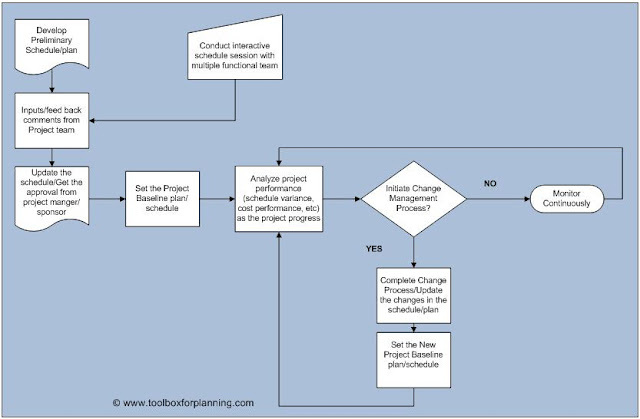 - Complete change management process in accordance with your change management procedure if the changes are required. - Update the changes schedule, resources in the schedule . Make sure your team agreed with changes you made before re-baseline the plan. - Finally, set the new baseline as Primary Baseline (BL1) in Primavera P6 , Target 2(target-1 is original baseline ) in P3, Baseline 1 in MS Project. Thanks for your sharing knowledge.